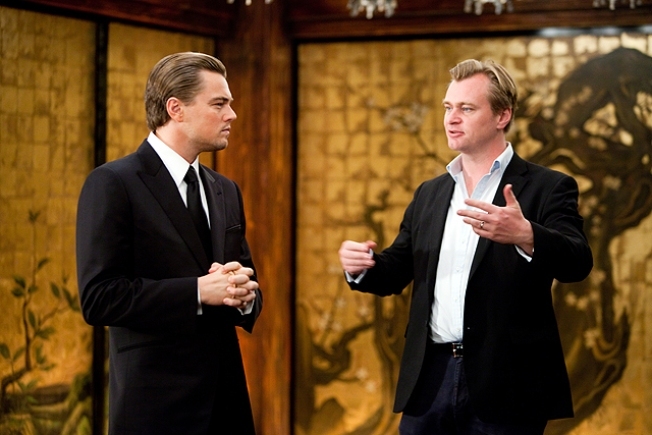 (L-r) LEONARDO DiCAPRIO with Director CHRISTOPHER NOLAN on the set of Warner Bros. Pictures� and Legendary Pictures� sci-fi action film �INCEPTION,� a Warner Bros. Pictures release. Don’t rule out “Inception” when it comes to major movie awards. The Christopher Nolan film won for best original screenplay at the Writers Guild of American Awards last night, according to The Hollywood Reporter. "Inception"-- penned Nolan--surpassed other contenders such as "The Fighter" and "The Kids Are All Right" in that category. "The Social Network" won for best adapted screenplay--screenwriter Aaron Sorkin wrote the story from Ben Mezrich’s book "The Accidental Billionaires." Sorkin had already won a Golden Globe for his “Social Network” screenplay. Critically-acclaimed "The King’s Speech," one of the front-runners for the Academy Awards, could not receive a WGA award because of union rules. Other winners at the awards included "Mad Men," "Modern Family," "Boardwalk Empire," "30 Rock" and the documentary "Inside Job."